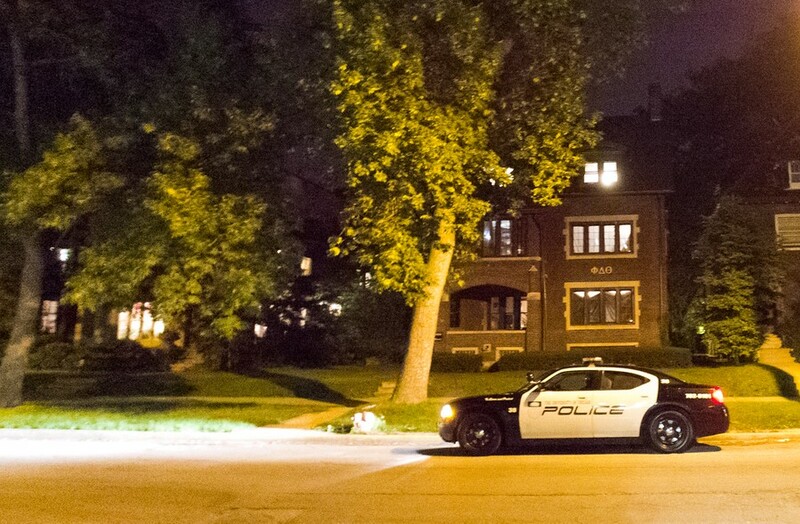 A UCPD squad car sits outside of Phi Delta Theta Thursday evening after the fraternity received a bomb threat. The fraternity says that it is the victim of an anti-gay and racist prank. Update, 6/13/13, 12:31 a.m.: The following article has been updated to reflect precautions taken by Phi Delta Theta in response to a bomb threat received Thursday evening. The Phi Delta Theta (Phi Delt) fraternity on campus became the center of a firestorm of criticism and received a bomb threat earlier this evening after the Chicago Sun-Times reported yesterday that the frat was involved in an incident involving racist and homophobic slurs, but the fraternity says that they were the victims of an anonymous prank. Phi Delt president and third-year Piotr Wilk said that the fraternity was not evacuated from their house because of the bomb threat, but reported it to the University of Chicago Police Department (UCPD) as a precaution. According to Wilk, a shipment of four or five boxes filled with more folded-up boxes addressed to “Reggin Toggaf”—a homophobic and racist slur if read backwards—was left at the fraternity’s front door on Friday, May 24. Because the boxes were left at the front door, fraternity members did not interact with the postal carrier who delivered them, and figuring that the delivery was a joke, disposed of the boxes. The following Wednesday, May 29, U.S. postal carrier Iran Becton, who is black, delivered 79 identical boxes with the same two slurs on them. When members of the fraternity told Becton that they had not ordered a shipment, according to Wilk, he insisted that they be delivered because they were taking up space in his truck, preventing him from delivering other mail, and, he said, because he had a duty to deliver the boxes to the address listed on them. According to Wilk, six Phi Delt brothers then helped Becton move the boxes out of his truck and several brothers notified the post office that the fraternity had not ordered the boxes immediately after they were delivered. “I can say with certainty no member of this chapter, either a residing member or an out of house member, placed this order,” Wilk said. He added that the post office had traced the sender of the boxes to a Chicago suburb. In the Sun-Times article published Wednesday evening, Becton offered a different description of the events, saying that he had to go back and forth from the house six or seven times, and that after he had delivered all the boxes the Phi Delt brothers specifically told him to read what was written on the box backwards to get the joke. The Sun-Times reported that Becton thought that the fraternity was playing a racist prank on him. Members of the fraternity were not contacted for that article, according to Wilk. Mack Julion, the president of Chapter 11 of the National Association of Letter Carriers, Becton’s union, visited the fraternity on June 8, during Alumni Weekend, and said a fraternity representative confirmed Becton’s version of the story. “Speaking with the former president [of the fraternity], he pretty much indicated that the carrier’s account of that was true. Now, I don’t know how [Becton] would know to read it backwards if someone didn’t mention it to him. It sounds strange that they would want to change their account of what transpired, particularly if they were not the ones who originated the mailing,” Julion said. Wilk, who was not present during the conversation with the former president, said that Julion’s visit was brief, and that the former president did not corroborate all of the details of Becton’s story, but only agreed that the brothers had told Becton that the incident was a joke. Julion also said that members of the fraternity told him they were not responsible for sending the boxes. “[The fraternity brothers] said they didn’t do it, and maybe they didn’t. They seemed to be sincere when I spoke with them,” Julion said. While visiting the fraternity, Julion told the brothers that because Becton felt threatened delivering to the fraternity, he would cease delivering to that location until the fraternity sent a letter of apology to Becton and he no longer felt threatened. On June 11, the fraternity sent a letter to the union “expressing our sympathies for the fact that the carrier had to go through this,” Wilk said. In the letter, Wilk also said that the fraternity has African-American members “and welcome them embracingly.” According to Wilk, the fraternity received mail today, but it is unknown who the carrier was. In response to the incident, Phi Delta Theta International Fraternity launched an investigation, and preliminary results found the fraternity not to be at fault. “Phi Delta Theta worked with local alumni officers and university officials to conduct an on-site investigation. During the course of this initial investigation it was determined that the Illinois Beta Chapter of Phi Delta Theta received these shipments from an anonymous source, not associated with the chapter, unprovoked,” the organization said in a press release. Phi Delta’s claims were supported by Assistant Vice President for Student Life Eleanor Daugherty in a letter to the editor she sent the Sun-Times after the article was published. “The [Sun-Times] column and its headline are misleading, especially in the unsupported claim that University of Chicago students carried out this extremely offensive act.... The [Phi Delta] students indicated that they did not know who had sent the packages, and we had no evidence pointing to individuals who might be responsible,” Daugherty wrote. In the letter, Daugherty said that the University had provided a Sun-Times reporter before deadline with a statement that said fraternity members were not responsible for the prank that was not included in the published version of the article.